This is my personal want list, and the reasons are varied. As I receive the cards on the list, I'll update their status below. For the most part I like high end cards, but vintage is tough to find in decent shape at a decent price. I prefer PSA over BGS grading because of the trimming rumors surrounding BVG cards. True or not, it's enough to keep me away for the time being. For modern cards, I look for a grade of MT 9 or higher. For 70's cards, NrMT-MT 8 or higher. For pre-70's, EX to EX-MT 5-6 or better. 1. 1986 Fleer Michael Jordan RC - GOT IT. MJ, in my opinion is the greatest player ever... not just in terms of statistics, but the way he took over in the 2nd half of big games. Entire teams would fall apart trying to guard him. I've never seen another player with an inate ability to adjust to a defense and score. I was 5 years old when I first saw him play in a Carolina blue uniform. I grew up watching him and following his career. Believe it or not, I was actually a bigger Sam Perkins fan at the time! 2. 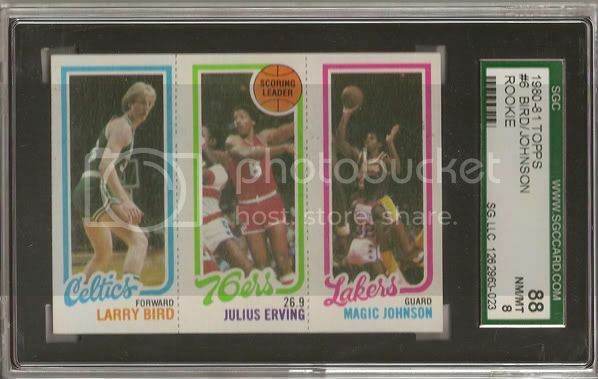 1980 Topps Magic/Bird/Erving RC - GOT IT. I grew up watching this rivalry, and it was something special. Basketball was not a popular sport in much of the country until these two players stepped onto the court in the NBA Finals through the 80's. You've probably heard it before, and I'm here to tell you it's true... These guys paved the way for basketball's rise in popularity in the late 80's. 3. 1970 Pete Maravich RC. Pete Maravich, a.k.a. Pistol Pete, left us too early. Before his NBA career began, he was the all-time NCAA scoring leader...a record he still holds today before the 3-point line was established. When I used to attend basketball camp every summer, the Pistol was always a topic of conversation. He was a coach's player. Unfortunately an injury led him to alcoholism and eventually a heart defect that took him too early. I still teach his ball handling techniques to youngsters today. His ball handling drills are effective 40 years after he developed them. 4. 1961 Fleer Wilt Chamberlain RC. 100 points in a game. Enough said. He dominated the paint on the offensive end to the point that the NBA had to actually widen the lane. How many players are credited with changing the rules of the game? Besides Mikan, none that I can name. Not bad for a guy that didn't even want to play basketball in high school. He said it was a game for sissies. 5. 1961 Fleer Oscar Robertson RC. Oscar Roberston is the only player in NBA history to AVERAGE a triple-double over 5 seasons. I had to look up this next stat because I couldn't remember it off the top of my head: 181 Triple Doubles in his career... Nobody has came close to breaking this record. I prefer the classic RC's. I'm an old school collector (20+ years), and I love vintage cards. There is something special about the rookie card that has withstood the test of time and maintained its value, particularly the high end RC's, through all the changes in the hobby. I finally picked this one up in late January on Ebay for $1,016.00. It's graded PSA 9 with almost perfect centering (50/50 L-R and 60/40 T-B). 4 sharp corners and perfect edges. Small fisheye on the blue name background. That's probably the only thing that kept it from a 10. It's the most I've ever paid for a single card, but it was well worth it in my opinion. I won a SGC 88 NM/MT card off Ebay last week. So far this crappy economy is a blessing to me. I won if for around $160.00 My RC wish list is moving along nicely. I'm thinking of taking a break for a few months because I'm working on some other sets at the moment that I would really like to finish. I've been working on a '72 Topps set that's about 50&#37;, and I started building the '07 Chronology Timeless Memories set. Like most collectors, I always have several sets I'm building at the same time. Nice stuff. Might want to add Mikan, West, a few others to that list eventually Bill Russell 57-58 Topps would look good too.